At InStyle Succulents we mainly focus on pot planting, but hanging baskets are a wonderful way to enjoy your succulents at eye level and green up vacant areas. 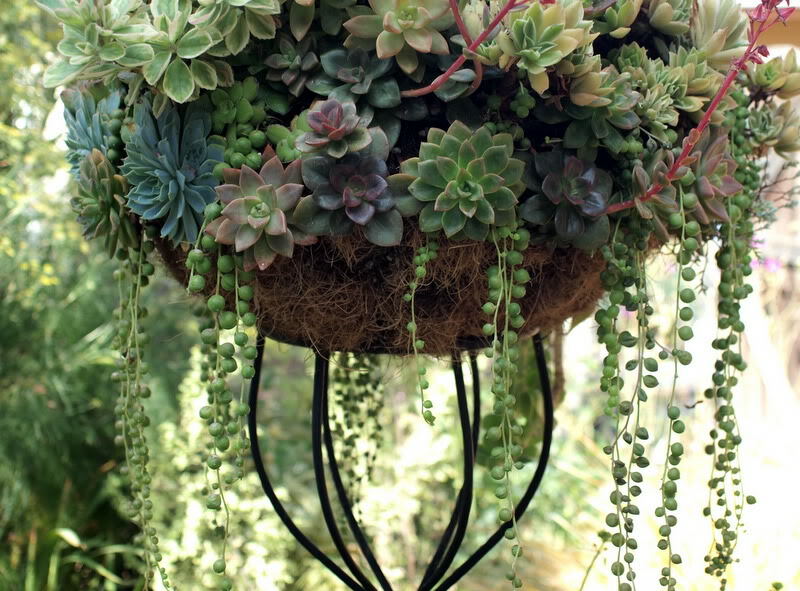 Succulents are the best choice, as hanging baskets can be pretty brutal environments for plants to grow; They’re often hot, dry, and vulnerable to wind. Ensure you use a quality potting mix such as Searles Cacti & Succulent Mix to give them the best chance, and fertilise with Searles Flourish Cacti & Succulent Plant Food. 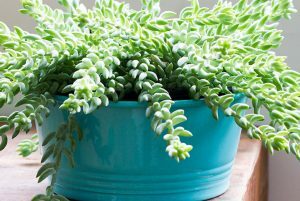 Spreading succulents are best, as they grow very quickly, and will trail down the sides to soften your basket edge. 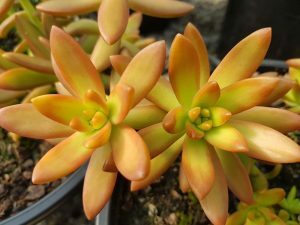 We have a huge selection of Spreading succulents that would all be wonderful choices, but here’s a few favourites to get you started. Sedum Donkey Tail is one of our absolute favourites for it’s unique, bluish green, rope-like stems. Enjoy the chunky leaves flowing down your hanging basket. Sure to be a talking point in your home or garden! This one can get a little heavy, so make sure you have good support before hanging up. 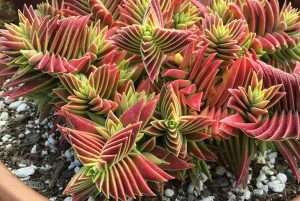 Crassula Capitella is an interesting architectural plant with layered, ruby, triangular leaves. It’s of of our most striking choices of spreading succulents and really has that wow factor! You’ll find it’ll definitely draw attention with it’s hypnotic structure and intense colour. 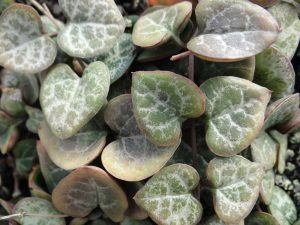 We’re in love with Ceropegia Chain Of Hearts! It’s a whispy and flowing plant with marbled, heart-shaped leaves. A fabulous choice for a hanging basket, with a cascade of hearts tumbling down. An excellent choice for indoors, or in a sheltered and bright outdoor position. 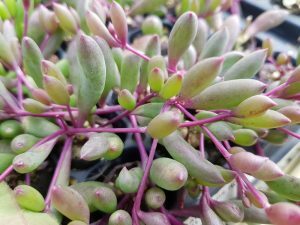 If you want lots of lovely colour in your design, then Sedum Adolphii is a great choice. It is a rangy creeper, developing casual rosettes of football shaped yellow green leaves. If you put it in complete sun, you’ll be rewarded with amazing orange-red highlights. This plant has been one of our most popular! 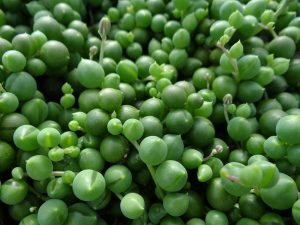 With perfect spherical leaves, Senecio String Of Pearls will definitely be a talking point in your home or garden. The beads trickle down long strands, making this a wonderful choice for hanging baskets. During summer, fluffy white flowers bloom producing a sweet cinnamon scent that is just divine.